Looking up at the night sky, you might think that space is dull, with lots of black, some white dots and just a hint of red if you're lucky. But if we look deeper, space has a lot more to offer than what our eyes can see! You've probably heard the phrase 'visible light'. This is what we call the range of colors that humans can see with their eyes. Visible light is just a tiny portion of all light. So astronomers have built special telescopes to see things that human eyes can't! For this picture, three telescopes were used and each picked up a different type of light. If you've been following other Space Scoops from the UNAWE web site you might recognise the object in this picture from the story on 'A Surprisingly Bright Superbubble'. This is a 'superbubble', a cloud of hot gas blown away from bright, young stars at its center. 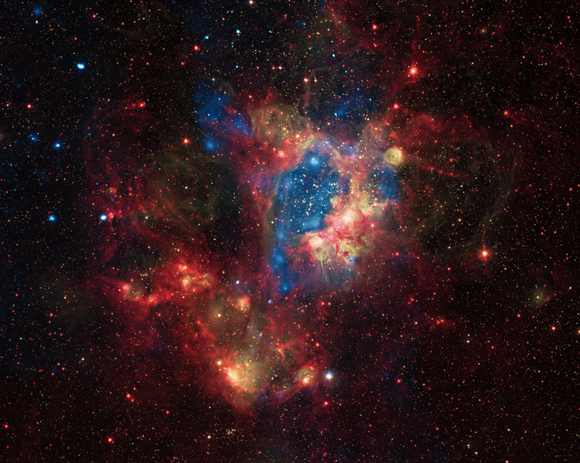 The superbubble has been captured with one of the telescopes in X-ray light, which has been colored blue. X-rays have a lot of energy, so when we look at the Universe in X-ray light, we see some of the hottest gas and most powerful explosions. Infrared light is given off by much cooler objects than stars. For example, humans give off infrared light of our own! 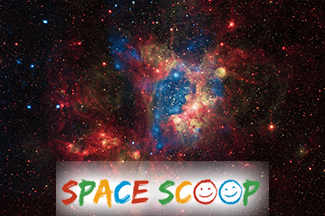 In this picture, infrared shows us the colder gas and dust of the superbubble, colored in red. This part of the picture was taken with the second telescope. The rest of the picture is yellow, showing us visible light. These are the parts of the image that we could see with our own eyes, if we were close enough! Cool fact: You probably use light you can't see everyday. Like your remote control, did you know it uses infra-red light to communicate with your TV? Try this UNAWE experiment at home and you can see for yourself!